How to apply for the KIIP level test or midterm test or comprehensive test (사회통합프로그램 사전평가/중간평가/종합평가 신청) 2019. 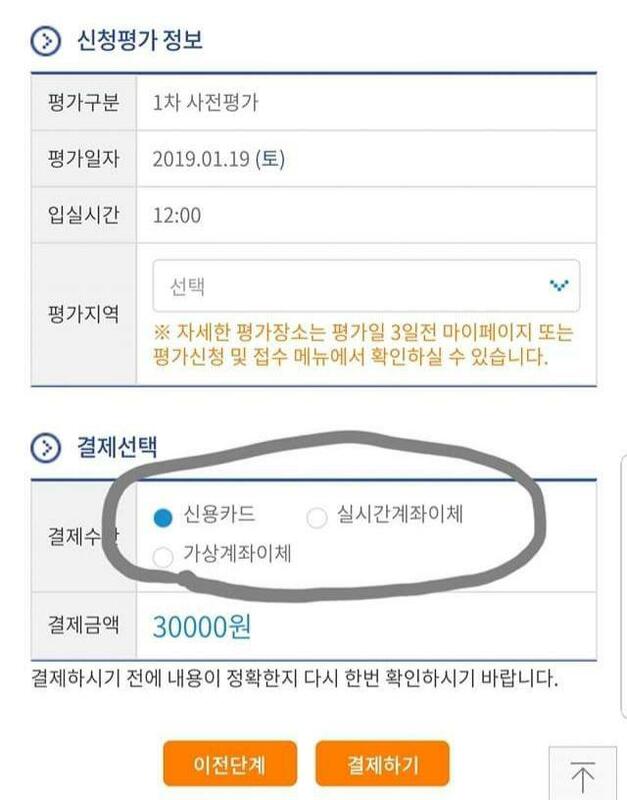 [사회통합프로그램 - KIIP] Notice: From Jan 1st 2019, when you apply for 사전평가, 중간평가, 종합평가 (Pre-evaluation, level 4 test, level 5 test), submission fee will be 30.000 won. If you already have a socinet.go.kr account, you want to register for a midterm test 중간평가 or comprehensive test 종합평가, skip step 1-2 and start from step 3. Step 2: Here are 3 options that you can select only one among them. 1) Start from level 0, without taking the level-test. Click 신청 button to apply. 2) Take the level test to get your proper level. Click 신청 button to apply. 3) Visit your nearby immigration office to submit your TOPIK certificate or related documents to get your proper level assigned. - If you select the option 1 (start from level 0), you will be redirected to the my page 마이페이지, which can be accessed by clicking the 마이페이지 button at the top right corner at any time. - If you select the option 2 (take the level test), you will be redirected to a new page as in the below picture. Step 4: At the new webpage (https://www.kiiptest.org/soci-net.do), fill in all required information to create an account at the test site. - When you fill in your address, click 주소찾기 then type your address in Korean. Then select your address from a list. - If you can't type Korean character, use https://translate.google.com to support you. 귀하의 휴대폰 인증번호는 613940 입니다. Enter the code in the box, and click 인증하기 (verify). If the code is correct, you will see this message 인증을 완료하였습니다 (verification is completed). - You can skip to select nationality 국적 and visa 체류가격, but don't forget to tick in the last box to receive information visa SMS. It is very helpful for registering the test and class later. Step 6: After signed in, you can see several options. Select level test 사전평가 as below pictures, then click 다음단계 (next step). In payment method, there are 3 options to pay the fee. d) finally print the receipt 접수증 출력. Congratulations! You have finished to apply for any KIIP test. Step 7: Print your receipt or save it on your phone when going for testing. - If you already have a valid TOPIK certificate, you can visit your closest Immigration Office to apply for the KIIP Korean class without taking the level test. - The test score will be announced after the test a week. Be sure to check your score and apply for your assigned class on time. - Your level test score is valid for maximum 2 year as long as you haven't registered for any class. That means if you can't register for a class this semester, you can still enroll in the next semester without taking the level test again. hi.anyone can help me..i cant open my account because i forgot my id and password please help me.. I have apply for level 2 but fails to make payment in time but still remains dateline to apply;in this case can I apply again?? Yes, of course. If I am correct, you don't need to apply again and just go to the payment page to proceed the payment. Is it possible to Choose location for class? or the decision up to them? The class location is up to you. They will give you several locations and time schedule. You choose 1 among those. i have selected the location SUWON but not mentioned the exact place(school,college,any other institutions) so how can i get to know about it? Previously, It will be assigned at about 3 days before the test. I am not sure how it is changed at the present. Please ask for support at this facebook group.